My husband and I spend as much time as we can at our property in the West Kootenays of British Colombia. It’s so peaceful there. That was kind of my healing grounds after my son Colin died by suicide three years ago. He was only 25 years old. I went out there and worked in nature and gardened. We planted an orchard and now we’re starting a cider business. I was trying to come to terms with Colin’s death. I was discouraged with what I learned. There was a lack of information about mental health, and yet suicides and depression were rising. What struck me the most was that when people finally did go for help, they were often having to wait months for treatment. I couldn’t let this continue. There are others out there, just like Colin, that need help and I’ll do what I can to encourage them to seek help and prevent future deaths. My biggest priority is that nobody ever gets turned away from help because of lack of funds and that people get the help when they want it. I want people to understand mental health so they don’t just brush it off because it can be so serious. And I really don’t want anybody to have to go through what we did. 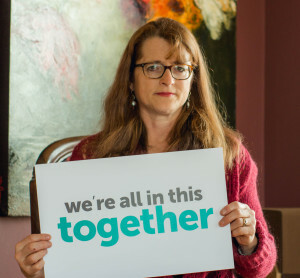 Through friends and board members, Barbara Ross found her way to Calgary Counselling Centre where she is helping to tackle depression head on. She sits on the Defy Depression cabinet. Along with other volunteers, the cabinet is helping to raise awareness and funds for our Defy Depression campaign. The initiative is raising money to support our leading-edge approach to depression treatment. Passion and commitment like Barbara’s is beyond valuable. Barbara has personally made generous investments but her support spreads so much further than that. She has hosted and participated in events in support of the Centre, her efforts have been vital in advancing the Defy Depression campaign, and most important of all, her willingness to share her story is changing lives. That’s huge. Learn how you can help Barbara, and all of us, Defy Depression. This entry was posted in Blog, Community and tagged donor; depression; counselling.